The SE-14 blaster pistol, also referred to as the SR Combat Pistol, is the most common blaster found in the galaxy today. Originally used as a combat droid sidearm, it was designed as a cheap, light weight and reasonably reliable pistol. Because of these characteristics, untold numbers of the SE-14 were produced. After the usefulness of droid armies declined, many surplus stockpiles of the SE-14 were released for sale to the public. Many governments attempted to place restrictions against the trade and use of these weapons based on their small size. The concern arose from the ease of concealability and security forces believed that the SE-14 would prove more problematic than useful to the average sentient. Comparable to many modern blasters, the SE-14 has reasonable penetration and range, and is best used as a short-range sidearm or a holdout-blaster. They can also be found in shops galaxy-wide, and as such are often found in the hands of low budget mercenaries and smugglers, as well as many honest sentients looking to defend themselves. 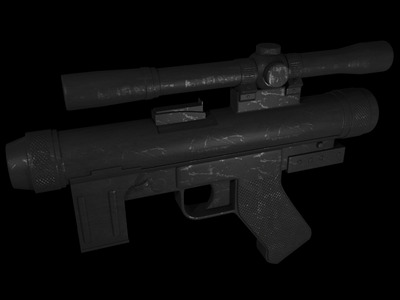 The simplicity of construction also allows for possible modifications, with many store-bought pistols featuring a telescopic sight mounted to the top of the weapon.